The scientists tagged thousands of ants in total to quantify all interactions between individuals and understand how colonies can protect themselves from disease. High population density, as well as frequent and close contacts between individuals, contribute to a rapid spread of diseases. To protect their colonies, ants have developed disease defense mechanisms, including adaptations to their social organization. Ants do not interact randomly with other colony members, but are organized in sub-groups according to their age and the tasks they carry out. While young worker ants, so-called “nurses”, look after the valuable brood at the center of the colony, older worker ants become foragers that collect food outside the nest. These forager ants are more exposed to pathogens. 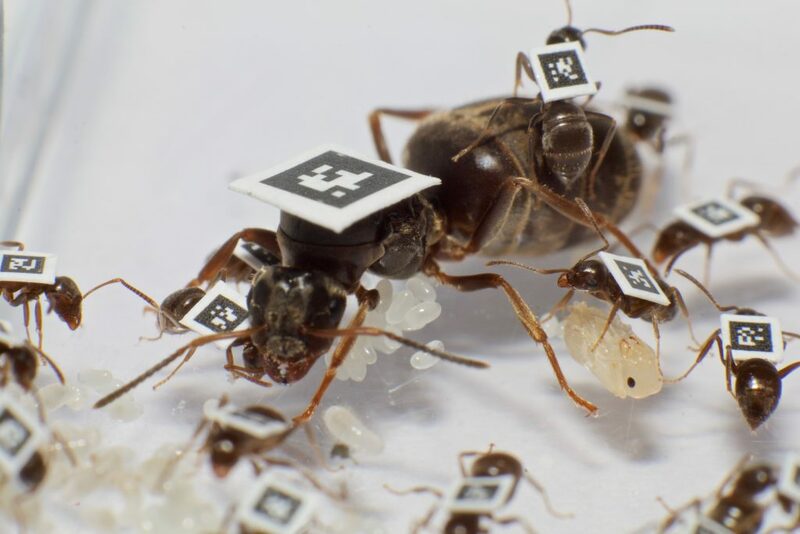 The researchers used a “barcode” system developed in the Keller group to follow the interactions between ants, especially to observe their behavior when disease spreads. In a first experiment, they placed digital markers on 2’266 garden ants. Infrared cameras took an image of the colonies every half second, and so the researchers could follow and measure the movement and position of each individual, and their social interactions. The researchers showed that the ants’ subdivision into groups acts prophylactically and reduces the risk that disease spreads. Because the ants changed how they interact, spores transfer patterns also changed. Only few individuals received a high pathogen dose, which could cause disease. In addition, more ants received a low dose, which Cremer and her group previously showed to not cause disease but instead be protective in the face of future infections – similar to variolation in humans. “The pathogen is distributed on many shoulders, and the ants’ immune systems can deal very well with this lower pathogen level, which provides a form of immune memory”, says Cremer. The analyses also showed that the colony protects especially valuable animals. The queen, the only individual that reproduces, and the nurses, young worker ants that can still contribute many hours of work to the colony, received less of the pathogen. “In a colony, not all animals have to be protected – but the most valuable individuals should survive”, Keller explains. More images are available for download in a Dropbox folder.